2-room apt.. mountain view. living / dining room, 1 double sleeper couch (1,4 m breit). bedroom, 1 double bed. shower, toilet. 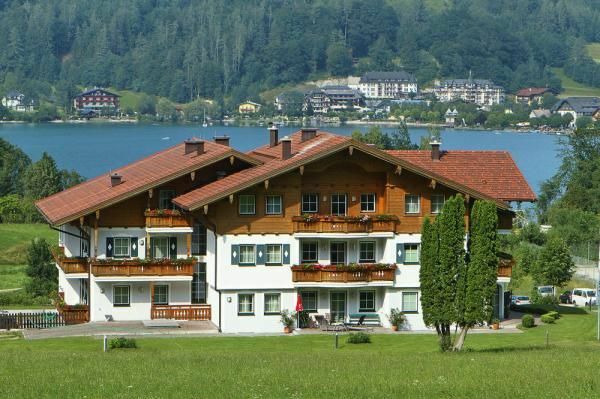 town center 1 km, shopping 1 km, restaurant 100 m, bathing 100 m, lake Fuschlsee 100 m, lake Wolfgangsee 6 km, location St. Gilgen 6 km, location Salzburg 20 km, location Therme Bad Ischl 20 km, fishing 200 m.
Alter der Kinder max. 12 Jahre. In winter, bookable at/on : OSB05500. playground, Climbing frame, trampoline. baby crib (included in maximum occupancy), highchair, please reserve. Finnish sauna, infrared cubicle. solarium (fee payable). rowing boat rental. beach volleyball, exercise machines, table tennis.